Wondering How to Make Your Teeth Straight? Orthodontic care can help correct your smile, regardless of the condition of your teeth. Orthodontic care helps stabilize the structure of your smile by guiding teeth into the proper position. Overcrowding of teeth occurs when there is not sufficient space in the mouth/jaw for each tooth to maintain its proper position. In some cases, extraction is required alongside orthodontia in order to open up necessary space for the teeth. 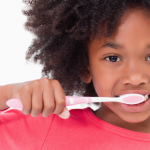 Overcrowding can cause tooth decay in the future if not corrected early on. Gapped teeth can become a problem when the teeth are spaced too far apart, whether that is because of missing teeth or an oversized jaw. These spaces often lead to food becoming trapped between the teeth, making it difficult to keep teeth clean and well-maintained. An underbite occurs when the lower jaw sticks out, such that the lower teeth close in front of the upper teeth. In some cases, an underbite can cause the abnormality of an extended chin. Besides this cosmetic problem, underbite leads to problems with chewing, swallowing, and speaking. Tooth enamel may be damaged and in some cases, underbite may lead to a disorder of the jaw joint. An overbite occurs when the upper front teeth protrude over the lower front teeth. This can cause the lower teeth to bite into the roof of the mouth. This is a very common orthodontic phenomenon that is most easily corrected during the teenage years. 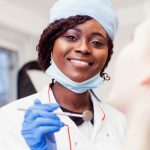 Traditional metal braces: Metal braces are the go-to option for patients with the most difficult and persistent orthodontic conditions. Extreme overcrowding and severe misalignment problems are considered complex cases that can be addressed most effectively through the traditional approach. The non-removable appliance straightens the teeth through gradual tightening. 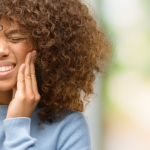 The wires and brackets put pressure on the teeth, which causes the teeth and underlying structures to move into proper alignment over time. The traditional braces approach has a few variations such as ceramic braces, which make use of clear or white ligatures to hold the teeth in place. However, because they are made of a lighter material, ceramic braces cannot be utilized for the most severe orthodontic issues. Lingual braces: Like traditional metal braces, lingual braces make use of the traditional elements of orthodontia including ligatures, an arch wire, wires, and brackets. What’s different is that the position of the appliance is inverted, being located on the inside surface of the teeth. As a result, lingual braces are invisible to everyone but your orthodontist! This approach is ideal for patients who are involved in contact sports and musicians who play wind instruments because they are more protected. And because they are custom-made for each patient, lingual braces can be used to address a variety of orthodontic problems. Invisalign: A brand name of clear plastic aligners, Invisalign offers a very different approach from traditional and lingual braces. The aligners are custom-manufactured to match the exact shape and size of your teeth, fitting over them perfectly. Every two weeks, you receive a new set of aligners in the mail, each of which will do their job to move the teeth gradually into the correct position. Patients enjoy the flexibility that Invisalign offers, as fewer orthodontic appointments are needed during this treatment. The treatment time is typically faster than traditional or lingual braces, taking approximately 18 months instead of up to three years. Because Invisalign aligners are removable, patients can maintain better oral hygiene and enjoy all their favorite foods. While metal braces can be difficult to clean thoroughly after eating, Invisalign should be removed during mealtimes. Once you’re done eating, you’ll need to brush your teeth again before re-inserting the plastic aligners. 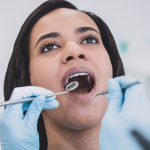 This feature makes Invisalign particularly attractive as the orthodontic option that involves the lowest level of risk of developing a cavity. Penn Dental Medicine offers affordable orthodontic treatment to patients in Philadelphia, New Jersey, and beyond. It’s not uncommon for patients to come from a distance to take advantage of our excellent services at such a low cost. If you think you’ll need to get braces soon, we hope you’ll visit us for an orthodontics consultation. Schedule your appointment by filling out this short form or by calling us at 215-898-8965.